Perhaps the most crazy way to print something on your Galaxy Tab is to connect to a Bluetooth printer and upload a document or image for printing. It’s not an obvious thing to do, and Bluetooth printers are kind of rare. Still, it works. Before you can print, ensure that your Galaxy Tab is paired with the Bluetooth printer. You may have to make the printer discoverable, and then you need to choose it from the list of devices. You may also have to type the printer’s PIN into the Galaxy Tab; the PIN should be displayed on the printer’s screen or available in its documentation. 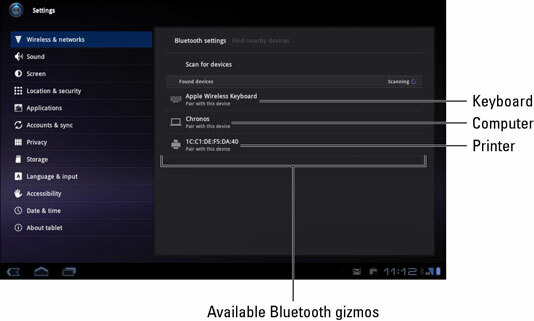 When the printer and the Bluetooth printer are properly paired, you see the printer listed under Bluetooth Devices on the Bluetooth Settings screen. Even if it says “Paired but not connected,” you’re ready to go. View the document, web page, or image you want to print. If a Share button isn’t visible in the app, press the Menu button to look for the Share command. Choose Bluetooth from either the Share or Share Via menu. Choose your Bluetooth printer from the list of items on the Bluetooth Device Picker screen. If a prompt appears on the printer, confirm that the Galaxy Tab is printing a document. The document is uploaded (sent from the Tab to the printer), and then it prints. You can view the uploading status by checking the notifications in the lower-right corner of the screen. Not everything on your Galaxy Tab can be printed on a Bluetooth printer. When you can’t find the Share command or the Bluetooth item isn’t available on the Share menu, you can’t print using Bluetooth. Bluetooth printers sport the Bluetooth logo somewhere.